Home › Home and Kitchen › Bodum Chambord 8 Cup French Press Coffee Maker 34 Oz. Chrome 34 Oz. Bodum Chambord 8 Cup French Press Coffee Maker 34 Oz. Chrome 34 Oz. Size: 34 oz. | Style Name: CHAMBORD | Color: Chrome When Bodum took over a small clarinet factory in Normandy in 1982, it was notbecause of the fine orchestra clarinets they were producing but because of arelatively unknown coffee maker called the Chambord which they produced aswell. The reason the French press coffee maker has become one of the mostpopular coffeemakers in the world is pure and simple, taste. The materials(glass and stainless steel) are completely taste-free so nothing comes betweenyour ground coffee beans. This is exactly the reason why coffee tasters usethis method to determine the quality of coffee beans. No paper filter not onlymeans no waste, but that the coffee bean's essential oils go directly to yourcup, delivering the flavor that is-lost on paper filters. Simplicity worksbest and is the reason why the Chambord's design has not changed a bit fromits original drawing. Make taste, not waste. Bodum's French press makes it easy: coffee, water, wait, enjoy. Simply measureout one rounded tablespoon of coarsely ground coffee per 4-ounce cup, pour inthe hot water, wait a few minutes for it to brew, and slowly press down theplunger. Next comes the best part, as you get to enjoy a cup of rich andaromatic coffee. Because of its 8-cup capacity and elegant design, this Frenchpress is great for dinner parties, where you can now brew your guests' coffeeright at the table. Bodum has been in the coffee business for decades, and thecompany continues to produce stylish, affordable, and reliable products. _--Maile Bohlmann_ From the Manufacturer When Bodum took over a small clarinet factory in Normandy in 1982, it was notbecause of the fine orchestra clarinets they were producing. In addition tomusical instruments, the factory also produced the coffee of a relativelyunknown brewer called "The Chambord." Bodum combined the skills of theseNormandy craftsmen with modern production. 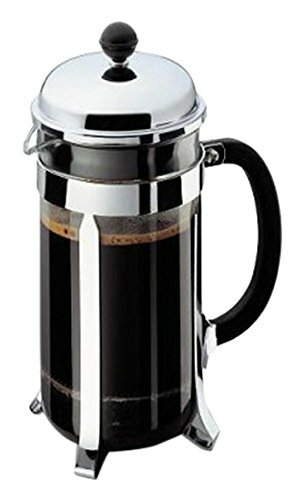 The result was a unique culinarytool, affordable to the many who loved the taste of what we now know as Frenchpress coffee. Thanks to Bodum, and thanks to the increasing need for better coffee, theFrench press coffeemaker has become one of the most popular in the world. Yetthe design has not strayed a bit from the original drawings, and Bodum stillmakes the Chambord with the same painstaking care and knowledge they gainedfrom those Normandy craftspeople years ago. The ease of brewing and thedelicious smell and taste of French-roasted dark coffee have remainedunchanged. Awards and Accolades In 2004 the Bodum Chambord coffee press received the American CulinaryInstitute's award for best French press coffeemaker. The American Culinary Institute judges food preparation products such asmixers, waffle makers, and electric teakettles. These products are judged oncriteria important to consumers such as ease-of-use, safety, and the qualityof the food produced. The institute also judges food preparation products usedin restaurants and hotels, including institutional mixers, large-volume coffeemachines, and food slicers. Instructions for Use 1. Place pot on a dry, flat, nonslip surface. Hold handle firmly, then pullthe plunger straight up and out of the pot. 2. For each 1.25-deciliter/4-ounce cup, put 1 rounded tablespoon or 1 Bodumscoop of coarse-ground coffee into the pot. Caution: Use only coarse-ground coffee. Fine grind can clog the filter and create high pressure. Place coffee maker on a heatproof, nonslip surface. 3. Pour hot (not boiling) water into the pot. Leave a minimum of 2.5centimeters/1 inch of space at the top. Stir the brew with a plastic spoon. Caution: Metal spoons can scratch or chip the glass beaker and cause breakage. 4. Place the plunger unit on top of the pot. Turn lid to close off the pourspout opening. (Does not apply to the Brazil models.) Do not press down. Letthe coffee brew for at least 4 minutes. 5. Hold the pot handle firmly, with the spout turned away from you, then usingjust the weight of your hand, apply slight pressure on top of the knob tolower the plunger straight down into the pot. Lowering the plunger slowly withminimal pressure produces best results. If the filter clogs or it becomesdifficult to push down the plunger you should remove the plunger from the pot,stir the brew, and then slowly plunge again. WARNING: Using excessive force can cause scalding liquid to shoot out of the pot. 6. Turn the lid to open the pour spout and then pour coffee. 7. Unscrew the filter assembly and clean the plunger unit after each use. Allparts are dishwasher-safe. Safety Instructions Not for stovetop use. Check glass beaker for scratches, cracks, or chips. Do not use a pot that is scratched, chipped, or cracked. Install a replacement beaker before using the pot again. Keep children away while using. Hot water is a hazard to small children! Do not allow children to use this coffeemaker. Scald Hazard Excessive plunging force can cause scalding hot liquid to shoot out of pot. Do not plunge with force. Turn lid to close spout. Use only coarse-ground coffee. Company History In 1944 Peter Bodum, the father of today's owner, Joergen Bodum, started Bodumin Copenhagen. Times were difficult at the end of World War II; there washardly any trade and people were out of work. Peter Bodum managed to wholesalea very small variety of housewares products by Danish manufacturers. After the war Peter Bodum got an import license for kitchen and tabletopproducts; he traveled all over Europe and ended up importing kitchen andhousewares to Denmark. As in the rest of Europe in those days, a lack ofproducts in Denmark meant a market existed for almost anything to be sold. Hespecialized in glassware from Eastern Europe. In the '50s Peter Bodum started developing his own products. He collaboratedwith the Danish architect Kaas Klaeson for a range of coffeemakers. At thetime, industrial-design-type kitchen products were very rare. The first Bodumproduct to hit the market in 1958 was the Santos coffeemaker--based on avacuum coffee brewing system. It became an instant sensation not only inDenmark but in all of Europe. Bodum still produces the original Santos designto this very day. Bodum grew steadily during the '60s, but sadly, in 1967, at the age of only57, Peter Bodum passed away. His wife managed the company until 1974, when sheoffered her 26-year-old son Joergen to join her in the management of thecompany. Joergen quickly brought on board Carsten Joergensen--then a teacherat the Danish School of Art in Copenhagen--and soon put him in charge ofoverall design for Bodum, including everything from products to corporatedesign, exhibitions, shops, buildings, catalogs, and advertising. It turnedout to be a very long and fruitful collaboration. The two men began to fulfillBodum's credo--"good design doesn't have to be expensive"--in lots ofdifferent ways. In 1974 the first fruit of Joergen and Carsten's collaboration was introduced:the French coffee press Bistro. It was also the first incorporation of the newBodum design language--beautiful simplicity and excellent materials foreveryday life. Many more variations of coffee presses followed. Since 1974Bodum has produced over 50 million French presses, taken the leap from"coffee" to "kitchen," and developed and produced a large variety of beautifulhousehold and tabletop designs. In 1979, when he took over the company, Joergen Bodum decided to move toSwitzerland in order to be more centrally located in Europe. He chose theLucerne area, where Bodum's head office has been located since the early '80s. In 1980 Bodum Switzerland and its design unit, Pi-Design, were founded. Then,in 1986, the opening of Bodum's first shop in London marked another milestonein the Bodum history. It was designed not only to be the perfect showcase forthe large variety of Bodum products but to embody an even strongerpresentation of Bodum as an international brand. Many more shops in many morecities all over the world followed: Paris, Copenhagen, Zurich, Lucerne, Tokyo,New York, Dallas, Okinawa, Auckland, and many more. To this day there are 52Bodum stores worldwide. With more and more of its own stores in place, Bodum continued broadening itscollection of beautifully designed everyday life products--from kitchen tohome. Today Bodum offers its customers everything from the latest coffee- andtea-making products to tabletop, kitchen, storage, textiles, bathroom, andhome office products. Some stores also have a cafe where Bodum's own selectionof coffees and teas are served. The Bodum Group is, and always has been, a 100 percent family-owned business.Today the company operates in 14 different countries with over 700 employeesworldwide. Bodum has holding companies in Denmark and Switzerland as well as12 sales companies, 3 production companies, and a design company called BodumDesign Group, located in Switzerland.